I never liked pork, even when I ate meat. The sight of ham made me sick, and I thought pork-based sausages smelled like garbage. But I do love tempeh bacon, always have a pack of Field Roast Spicy Sausages in my refrigerator and relish putting a sausage patty between a split vegan biscuit every once in a while. I like the smokey aroma, salty taste and faux-meaty texture. So making my own faux pork isn’t aimed towards replicating the version I can’t stand; rather, it’s about creating a plant-based alternative that embraces those qualities that I love. Since using farro as a base for vegan crab cakes, I was convinced that I could also use this grain as sort of a ground beef substitute as well but, after a few failures, kind of gave up. I always tried to grind this chewy and naturally al dente grain after boiling it which never actually worked, so decided to grind it while still raw, which gave it that soysage look and feel once fully cooked. 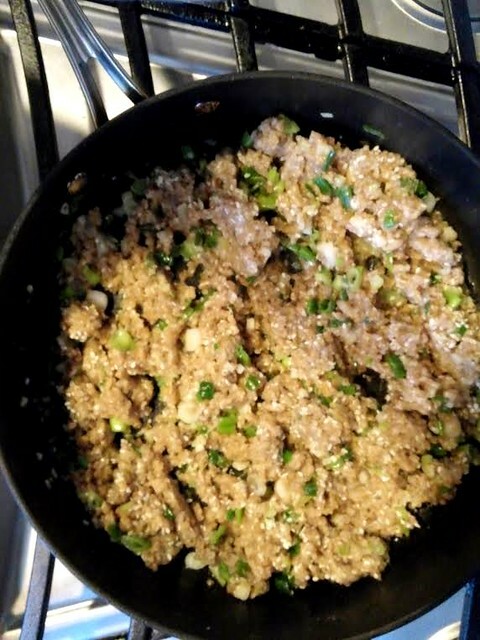 After adding in ginger, garlic, scallions and other complimentary flavors and textures, I thought the mixture would be perfect stuffed into wontons. These dumplings are soft, plump and succulent—and totally worth the extra work to assemble. If you’ve never made wontons, it’s a wonderful and meditative way to spend an hour or two in kitchen. After you’re done, you can freeze them and use them as needed for quick and easy dinners for several weeks to a few months. Place it with the broth in a medium-sized saucepan. Bring to a boil, then reduce the heat to a low simmer. 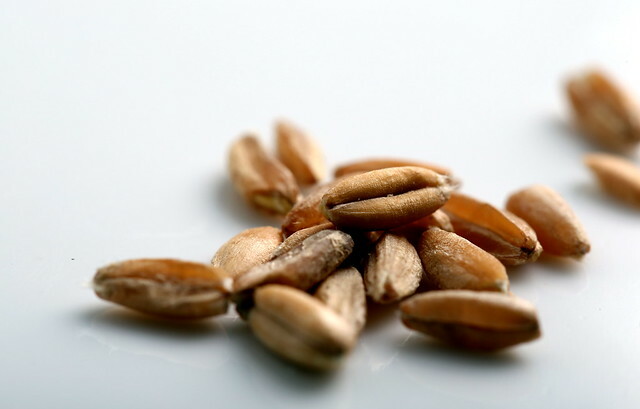 Allow to simmer, uncovered for about 12 minutes, stirring occasionally to prevent the farro from sticking to the bottom. Remove from the heat, cover and let it sit for an additional 12-15 minutes. 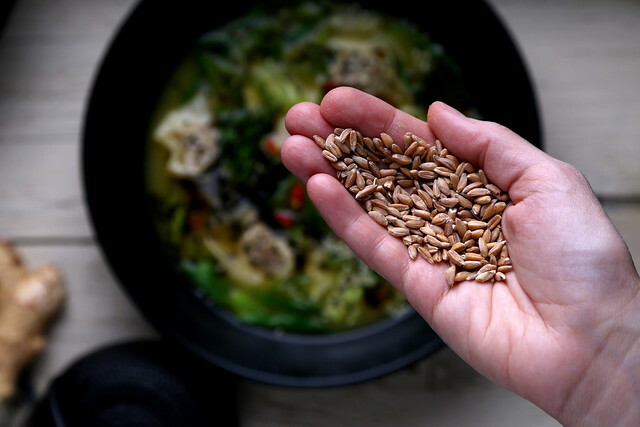 While the farro is simmering, heat the sesame oil over medium-low heat in a large saute pan. Add in the ginger and allow to soften for about 3 minutes. Add in the scallions and allow to become bright green, about 2 minutes. Add the farro to the saucepan and stir to combine. Next, add in the soy sauce, agave, rice vinegar, liquid smoke and stir gently. Add in the cornstarch slurry and stir again. Set aside to cool completely on the counter before making your wontons. Assemble your wontons. I recommend placing them on a silpat-lined baking sheet, ensuring they do not touch each other, then place into the freezer for a few hours. 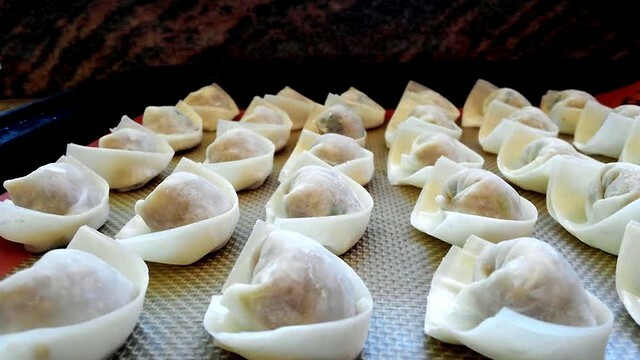 Transfer to a ziploc bag or container and keep frozen, taking out the desired amount of wontons as needed. Just allow them to sit out and defrost for about 30 minutes before placing them into hot broth to bloom. Place the sesame oil and shallots into medium-sized pot and allow to soften for a few minutes over medium-low heat. Add in the stock, then increase the heat to medium. When it reaches a small simmer, add in the soy sauce, stir, then add in the desired amount of wontons into the pot, dropping them carefully into it one by one, staggering doing so if the simmer reduces. Don’t overcrowd the pot to avoid sticking. 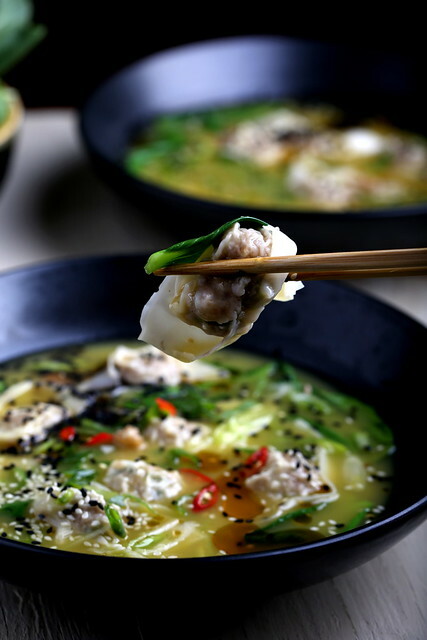 After 3-4 minutes, transfer the wontons to serving bowls using a skimmer or chopsticks, then ladle the hot broth over it. Add in the chopped boy choy to the broth, adding in any other components (sesame seeds, hot peppers, shiitake, cilantro, etc.) as desired. What brand of wonton skins are vegan? The ones I can find where I am (Chico, CA) always have egg whites. Your recipe looks great! The ones I used here were a Japanese brand, and just contained wheat gluten, cornstarch and water. I've found that most brands in asian markets are vegan. Dynasty brand, available in most supermarkets, are also vegan. Thanks for the info. What you report is definitely not my experience in supermarkets. Nasoya is one common brand here, and it's full of egg white. I'll try looking again at our local Asian markets. Thanks Lan! I do think that other similar grains would also work here. Something a little glutinous and can be ground easily and evenly would be perfect. Good luck on using up your CSA stash!! is there a typo in your quantity? does it really make 90?? I don't have room for that many in freezer. this looks really good. I'm going to consider it. I do have some wraps in my pantry that I picked up at Earth Fare in North Carolina. Hi Maureen — 90 is correct! Only 1 teaspoon of the mixture will fit correctly in the wontons (any more than that, and the wrappers start to buckle and split). It can be easily halved to make less if there isn't enough space in your freezer. I hope you enjoy! Ground farro = baller idea, thanks Erin! I did mine w finely chopped shiitake + five spice. ha! Thanks Andy! I've never tried chopped shiitake in wontons (I've only used oyster mushrooms), but it sounds like a great idea — I'll have to try it out!